The Toshiba B-EX4 has been discontinued. No direct replacement is available. A premium range of industrial printers for a wide variety of applications. 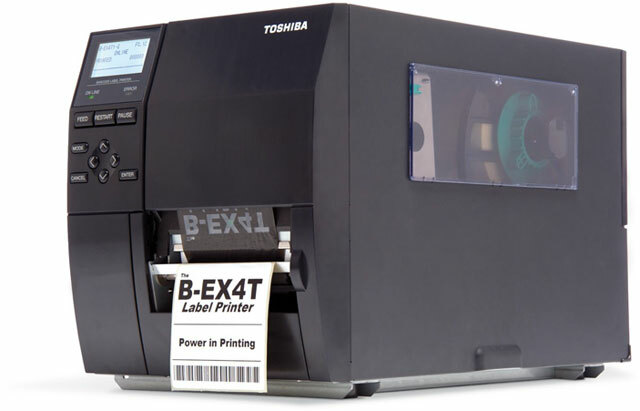 The B-EX4 incorporates a user-replaceable snap-in printhead and platen roller, which reduces maintenance costs. The unique intuitive graphical LCD "helpdesk" display improves usability and prompts even the novice user to take immediate corrective action where necessary, keeping user training to a minimum. With a speed of 14 ips, the B-EX4 boasts a 40% improvement in productivity on the SX range (10 ips). Ethernet and USB 2.0 are standard with options for parallel, serial and wireless LAN. It is fully compatible with the B-SX range, allowing for the swift migration of legacy printers. In addition, advanced processing capabilities facilitate high throughput.TEC has packaged the superior design elements of the market-leading B-SX4 into the matte-black B-EX4 to provide customers with a high-end industrial product at a mid-range price. Features include: side opening, double ribbon motor control, automatic center media loading, near-edge or fl at printhead, optional ribbon save, BCI (Basic Command Interpreter) compatibility.